This is a rare and very original Porsche early 911 survivor with very low mileage. The saying, “It’s only original once” applies to this car. This car has never been restored! With only 50,730 miles, it drives and feels like it left the factory. 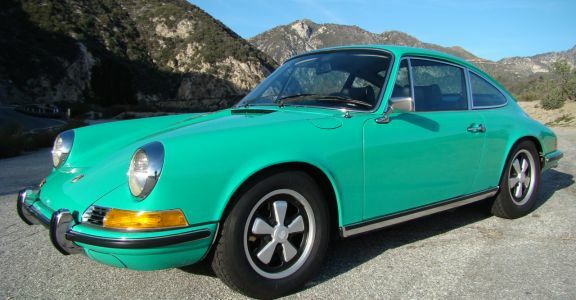 The vehicle's original condition and unique Jade Green body color make this a special 911 and sets it apart from other pristine examples. The paint is 100% original as it left the factory and is in excellent condition. A factory Certificate of Authenticity (COA) from PCNA shows Jade Green/Light Green (#227/6868) as the original color as delivered. Engine, transmission and chassis numbers match the COA. This car has spent its entire life in dry Southern California inside a garage and under a car cover. It is now only with its second owner from new. The original owner maintained this car in excellent condition. There is NO RUST. The interior is 100% original with no cracks or tears in the upholstery. The dash and speaker cover is perfect. The carpets are original and show little wear. The headliner is excellent. The leather steering wheel with tight stitching is perfect. There’s a small dent on the rear deck lid and on the front bumper. The car drives and shifts like new. The factory cosmoline preservative is still visible on the chassis and transmission. The engine and transmission are original to the car and operate without flaws. The suspension, brakes and fuel system have been checked and renewed where necessary to original specifications. Everything works on this car to ensure a nice driving experience, as the factory intended. This is truly an exceptional example of the mark, a centerpiece for every serious Porsche collection. The car is in California. Worldwide shipping is gladly arranged.